This pasta is so easy to make. It involves almost no prep and is done in 30ish minutes, if that. Plus, one pot! The tofu is optional; it requires more time and effort but it's very tasty and will up the protein by a lot. 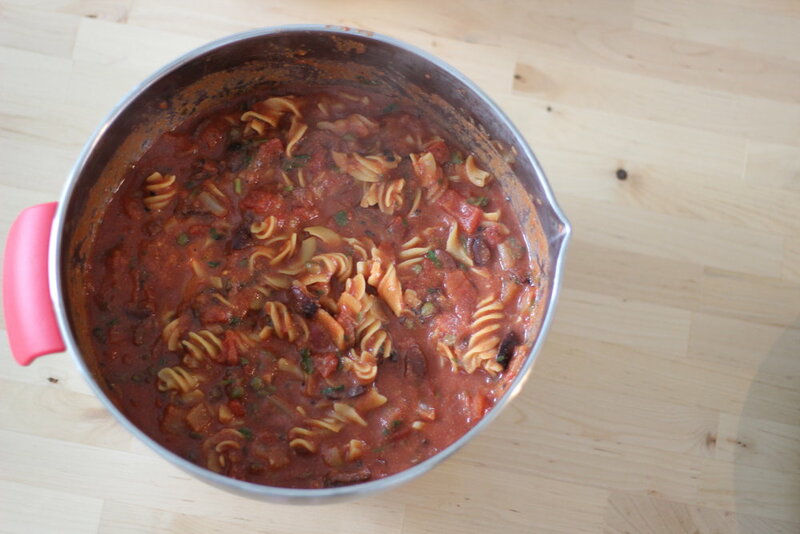 If you use chickpea or another kind of bean pasta, that will do it too. I used a red lentil-based pasta, but you can use whatever you want! 1. Mix the dry ingredients in one shallow bowl or rimmed dish and put the almond milk in another. Use one hand to drop the tofu pieces in the almond milk and move them to the cornmeal mixture, and the other hand to coat the pieces in the dry mixture. It’s a bit messy, but worth it. 2. If you have an air fryer, fry them at 325 degrees in batches for 15-20 minutes, flipping halfway through. Make sure they’re in a single layer or they won’t cook evently. 3. If you’re using the oven, put the pieces on a lined baking sheet and bake at 400 degrees for about 20-30 minutes, flipping halfway. 1. Put a large pot on medium heat. 2. If you’re using fresh garlic and onion, sauté them in a splash of oil or water for a few minutes. If not, add the splash of oil or water and then the eggplant. Cook for a few minutes until it starts to soften. 3. Add the remaining ingredients minus the pasta and the fresh parsley, if using. After a few minutes, add the pasta, stir to coat, then add enough water to cover the pasta. Turn the heat up a little. Let cook for about half the time the pasta package requires, then check to see if it needs more water to cover the pasta. If you add too much water, you’ll end up with more of a soup, which is also good so no worries if that’s what happens. When the pasta’s done cooking, so are you! To serve, plate it up in a bowl (I love bowl food, it’s the best). Put some of that crunchy tofu on the side, and sprinkle with fresh parsley (if using) and vegan parm (or regular, if you’re a dairy person). Enjoy! Note: Olives and capers are really salty, so you probably won’t need extra salt for this recipe, but do what your taste buds say. If you don’t like salt, this dish is not for you, I’m sorry. But you could decrease the saltiness by rinsing the olives and capers before adding them to the pot.